Chocolated out yet? I freaking am. So chocolated I think it literally made me sick. But this is a food post, so I'll spare you the deets. So listen, when I was in California for a while (because our transmission broke in Encinitas, CA) I noticed the Californians went crazy over Acai bowls. I personally had become addicted to tacos back in Texas and was struggling to be interested in any sustenance which wasn't a wrapped in a warm corn tortilla, but decided for the thrill, I'd give it a try. Now they were a bit spendy for someone with a broken transmission and barely enough money to cover fixing it in the bank, but we set up our van with my clutches and my husfriend's photos and hustled for some money all day. Now, I didn't make this recipe up, Green Kitchen Stories did. I've been obsessed with David Frenkiel &Luise Vindahl for years, since I worked at Alex & Alexa and used to convince them to create recipes for kids for A&A's blog. They're super kind and have managed to create a beautiful story for themselves with their blog, Green Kitchen Stories. I have their Apps and their Cookbooks and both are beautiful and inspiring, especially, if you, like me, have a lack of internal drive when it comes to kitchen duties. 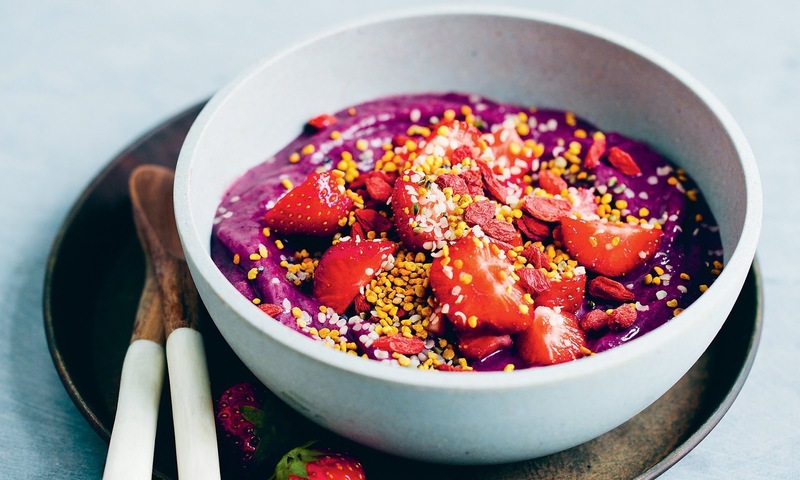 My other obsession is Honestly Healthy (Alkaline eating recipes, which I talk about here) and Tash, who is one of the founders, posted this Green KitchenStories' acai bowl recipe on her own blog bringing added approval from both admired communities. Thus i was convinced to try, in hopes I might hit optimal health again by Christmas. I've adjusted it slightly to use fruit in season, in France. 2. Add the nut butter, protein powder or soaked nuts or seeds, if using. 3. Mix until creamy and smooth. Notes: Aim for a frozen yoghurt consistency. Blend the fruit, milk and acai powder. Add the nut butter, protein powder or soaked nuts or seeds, if using. Mix until creamy and smooth. Spoon the acai mixture into bowls and top with sliced fruit, hemp seeds, bee pollen, goji berries and a drizzle of honey, if using. Serve immediately. Be sure to check out Green Kitchen Stories blog, app and cookbook for more delicious recipes, and Honestly Healthy's blog, app and cookbooks as well!